This white board class pack is perfect for use in schools for group work. Included in the pack are 10 x A4 rigid rainbow framed pupil boards, along with 1 x A3 rigid rainbow framed teacher board and 10 dry-wipe markers. These are all supplied in a tough storage box which comes with a detachable tray and a carry handle for easy use and storage of the class pack. Choose the magnetic surface option and you will receive 288 lower case magnetic letters and 288 magnetic numbers! Cost-effective and reduces paper wastage in schools, the classroom pack can be used time and time again. Using mini-whiteboards in lessons brings many benefits to students. They are a perfect way of involving students with work in an interactive and enticing way. These lapboards have a dry wipe surface which makes correcting work of students easy and mess-free. This can help encourage students who may lack confidence in their work, in putting forward their ideas and answering questions alongside peers. Supplied in a sturdy storage box with lid, this rigid board class pack comes in a choice of magnetic or non-magnetic surfaces. Each pack contains all you will need for a group of 10 pupils. The ABS plastic rainbow frame on the student and teacher lapboards make them durable and appropriate for daily classroom usage. The core of these whiteboards are made from recycled materials. Make use of the 10 dry-wipe marker pens included in the pack by engaging students in group activities and encouraging interactive learning. 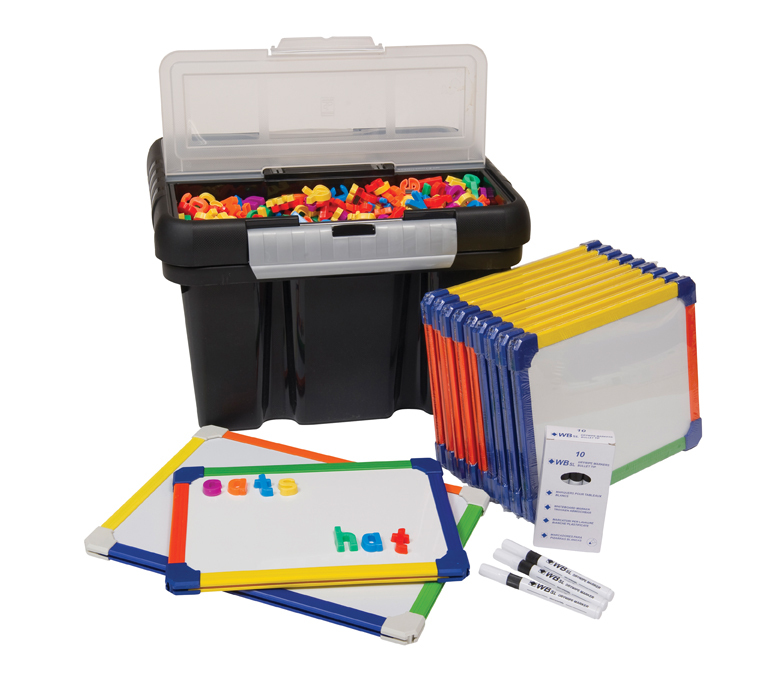 This whiteboard pack is lightweight, easy to transport, and has everything you need all in one box, making it ideal for taking lessons outdoors.